Cutting-edge demand classification technology integrated with network optimization and simulation enables cost reduction and increased inventory availability. 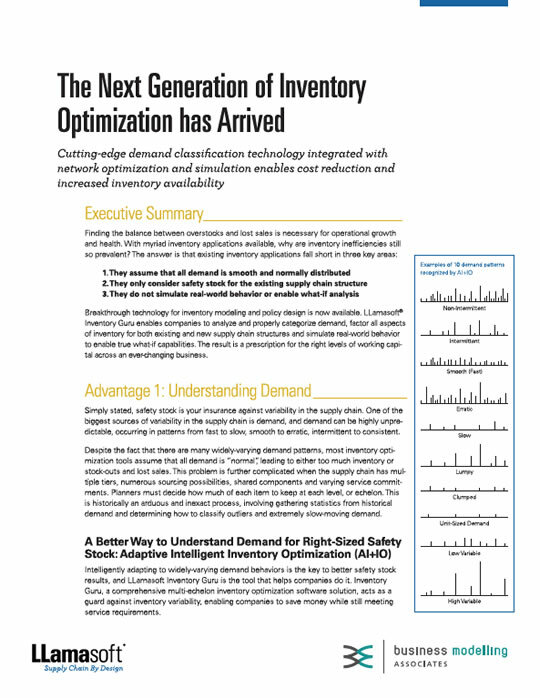 Breakthrough technology for inventory modeling and policy design is now available. LLamasoft Inventory Guru enables companies to analyze and properly categorize demand, factor all aspects of inventory for both existing and new supply chain structures and simulate real-world behavior to enable true what-if capabilities. The result is a prescription for the right levels of working capital across an ever-changing business.